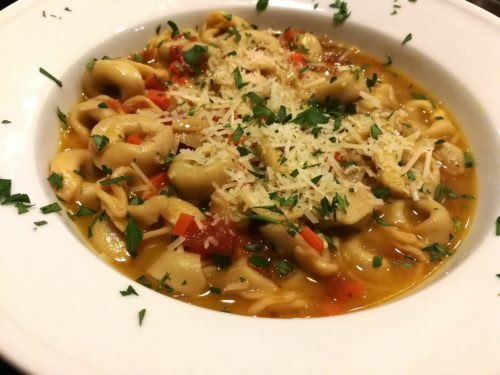 Italian Pesto Tortellini in Easy Au Jus. What’s better than a homey pasta dish? This is a super easy recipe with a little veggie chopping but well worth it. You can use my Easy Au Jus recipe or a can of your favorite broth. Trader Joe’s sells some cool products. One of my faves is their pesto-filled dried tortellini. 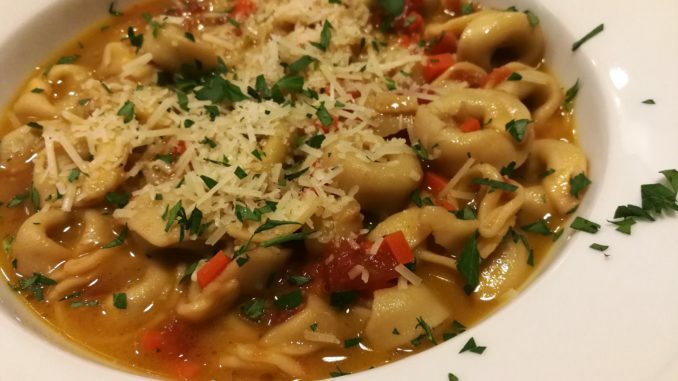 The pesto filling adds a bit of depth to the usual cheese tortellini. I buy a lot of the Trader Joe’s pastas as they’re good quality and fairly inexpensive. How to start? 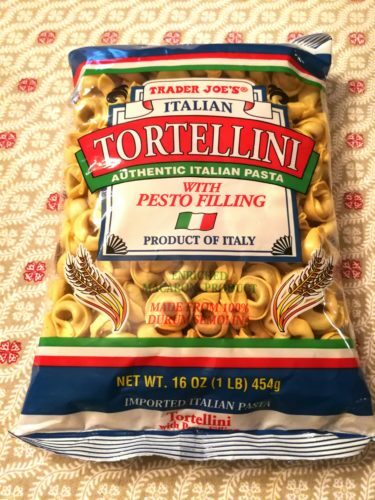 Cook the Trader Joe’s pesto filled tortellini according the package directions. 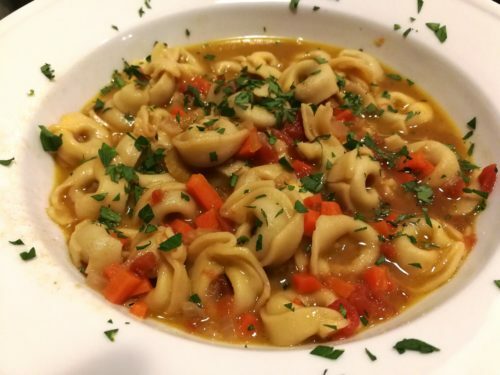 While the tortellini is cooking, make the Easy Au Jus sauce (see link to recipe below) and set aside. You can make the Easy Au Jus in a large batch and freeze it in smaller containers for future weeknight meals. 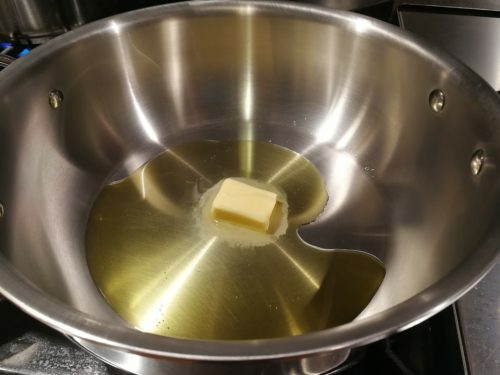 Heat some butter and olive oil in a chef’s pan. Finely dice some onion, celery and carrot. 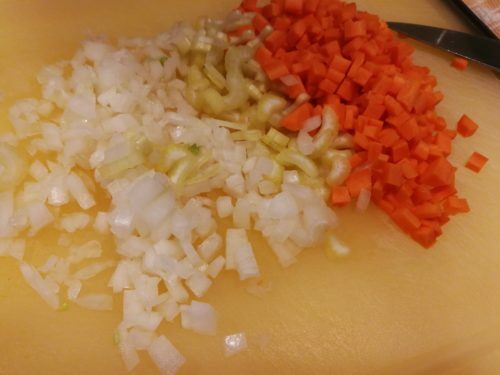 Cook the finely diced onion, celery and carrot in the butter and olive oil. 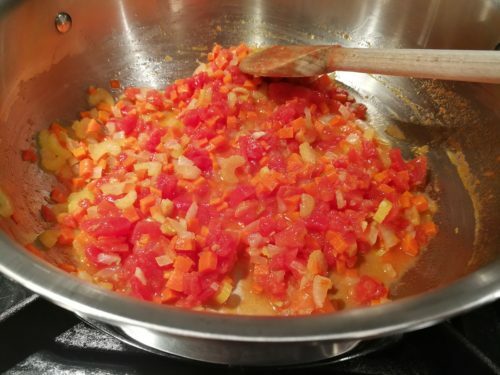 Add some finely chopped diced tomatoes and a bit of their juice. Cook until the juices have reduced somewhat. Now add some au jus sauce to the pan. Simmer until the sauce reduces a bit. 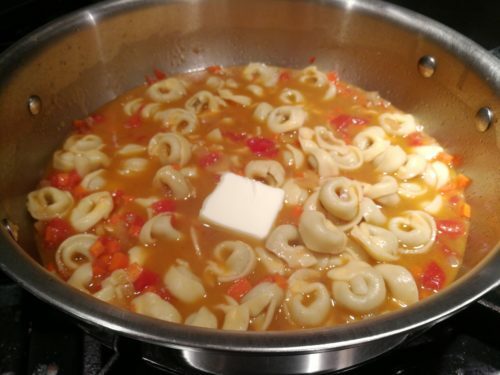 Add the cooked drained tortellini to the sauce and warm through. 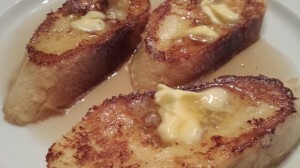 Finish the dish by stirring in a pat of butter and seasoning with some salt. Serve my Italian Pesto Tortellini in Easy Au Jus in bowls. 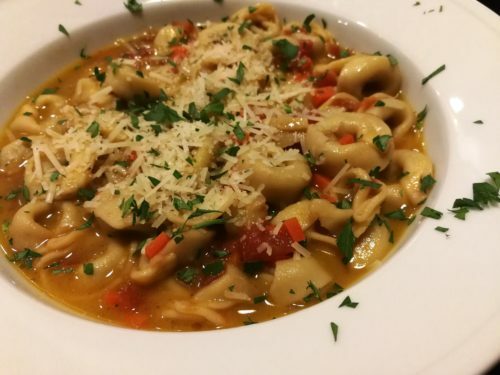 Garnish with shredded Parmesan and finely chopped Italian parsley. Offer with some crusty garlic bread. 1. If you have not made my Easy Au Jus sauce, you should do that first. 2. 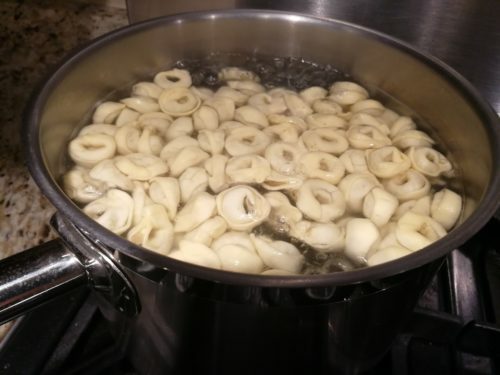 Cook the tortellini according to package directions while you prepare the sauce for the tortellini. Drain the tortellini and set aside. 3. Melt the butter in the olive oil in a Chef’s pan over low heat. 4. Saute the onion, carrot, and celery until the vegetables are translucent and soft. Do not brown them. 5. Add the chopped diced tomatoes and their juice to the vegetables. Saute a few minutes, stirring. 6. Pour in the au jus sauce. Simmer on medium-low heat until the sauce reduces a bit. 7. Add the drained cooked tortellini and warm through. 8. Stir in the unsalted butter to thicken the sauce. Season with a pinch of salt. 9. Ladle into serving bowls and garnish with the shredded Parmesan and chopped parsley. Makes two servings as a main course or four servings as a pasta course. 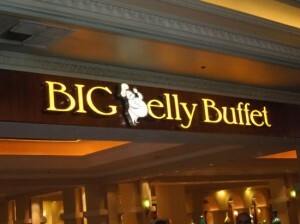 Offer with crusty bread and a Caesar salad. Variations: Add some diced cooked shredded beef or chicken and warm through before serving. 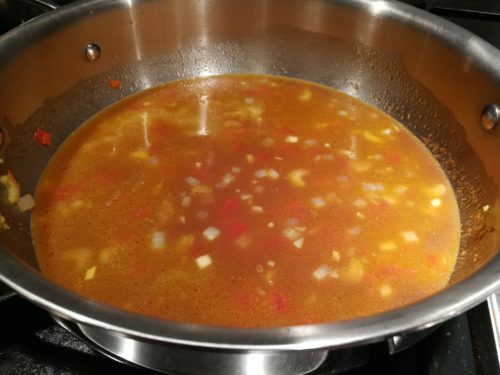 Substitute vegetable broth for the easy au jus sauce for a vegetarian option. Add some other vegetables such as finely diced mushroom and bell pepper.